Today I wanted to share with you a little project that I did with my dinning room chandelier. I find myself doing little projects all the time which is what I think really makes your home unique and designer. I started with a capiz chandelier from West Elm that used to hang in my master bathroom of our old house. I have always loved unique lighting and with its cascading capiz shells in a natural color and texture it fit the bill. I hung this in our new home in my dinning room and it does look stunning. I was inspired one day by an image of strings of crystals that made up a lighting fixture and thought that crystals would combine well with my light and give it a bit more polish. Lucky for me I had a bunch of chandelier crystals from a lighting fixture that I painted white and never reused (it was a DIY lesson gone wrong). 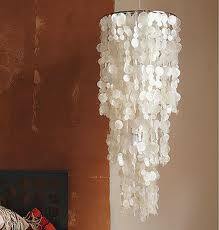 I started adding them by piercing the capiz shells on the bottom and hanging the tear drops to them. I then took the few strands that I had and hung some evenly around the top. The results are pretty good, and it looks quite modern and deliberate but I wish I had more strands of crystals to hand along the top. I may try to find some on line and really incorporate them. What do you think? Have you done anything similar? Hi Taj, I would love to see it. I looked up your blog and love it. I started in to blogging with fashion blogs. They've always been my guilty pleasure;) Do you have any pictures of your house on there?